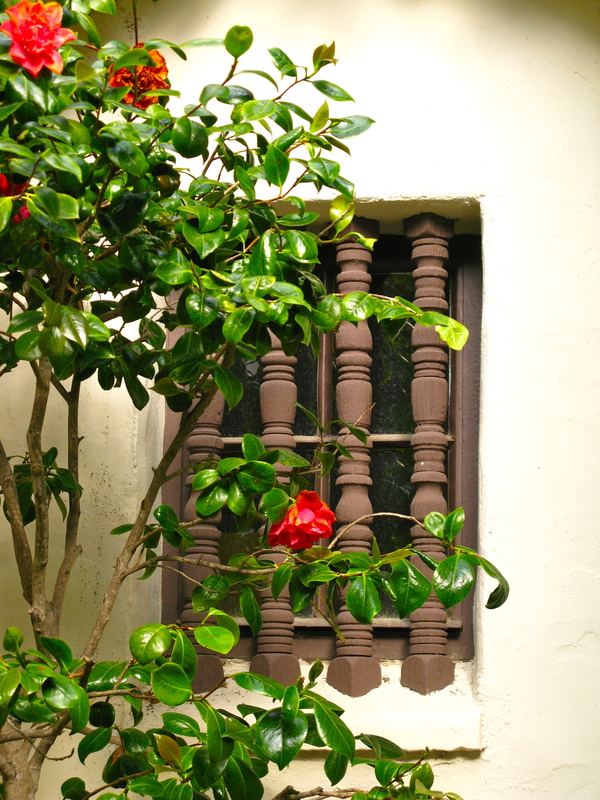 I often step into the tiny courtyard of the privately owned El Paseo Building. 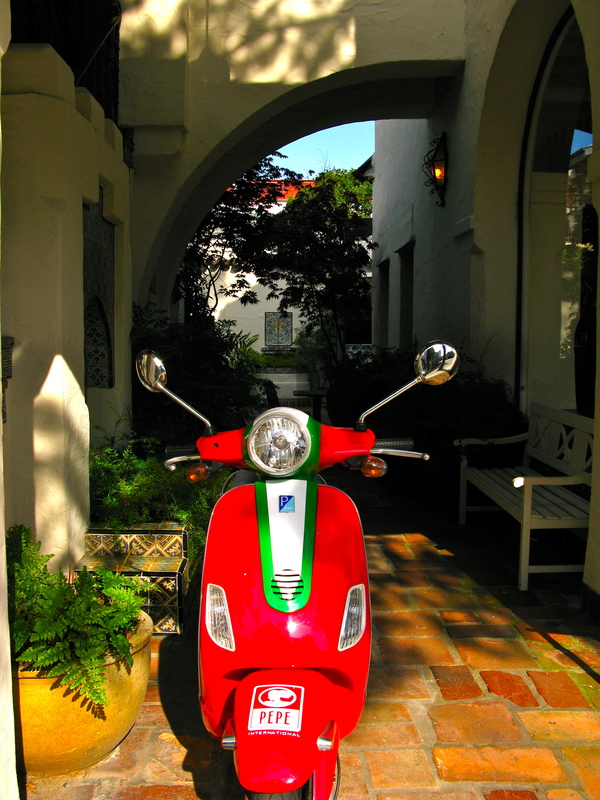 Much of Carmel’s business district was built in the 1920’s and reflects either the Tudor Revival Style that I see in The Court of The Golden Bough or the Spanish Colonial Revival style in this beautiful courtyard. 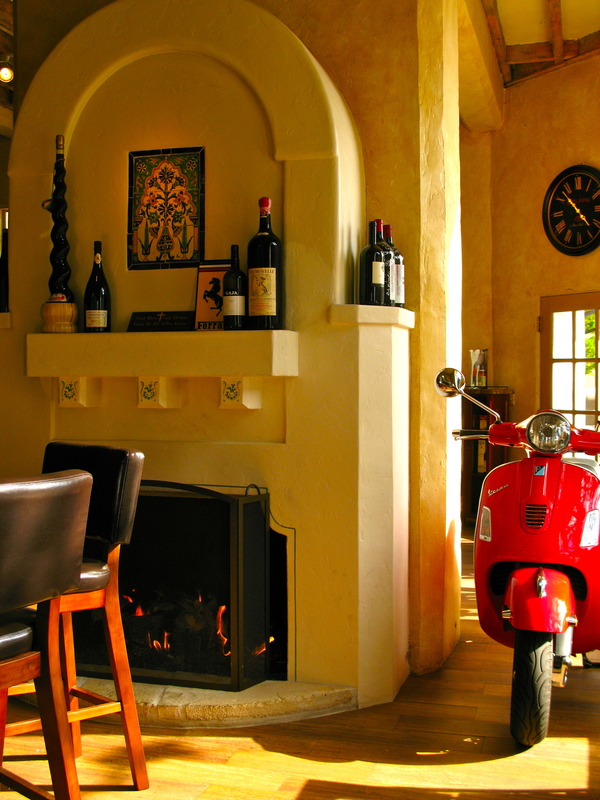 El Paseo is the passageway where new California meets old Spain. 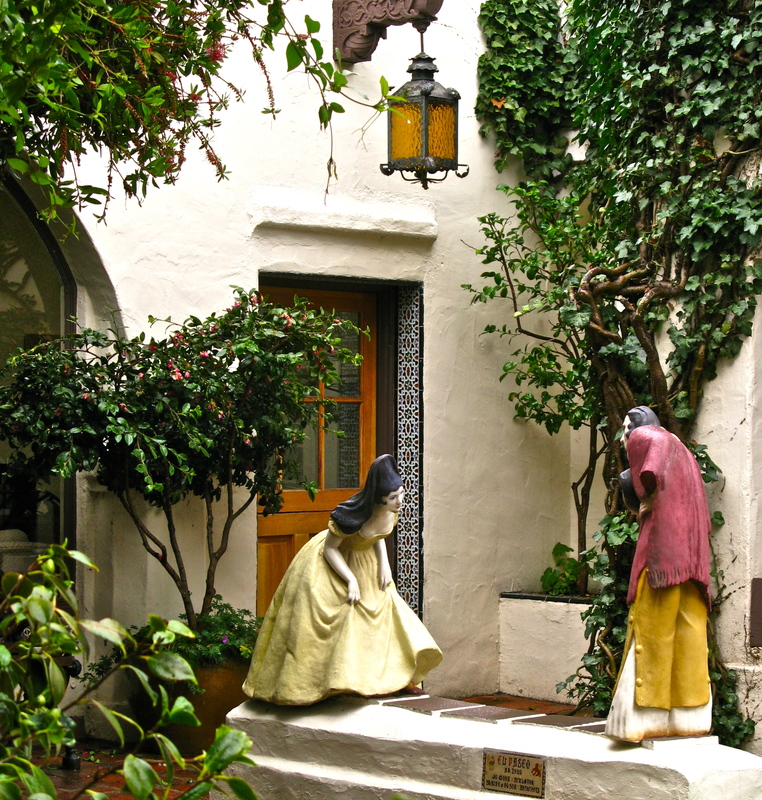 Many visitors walk by this courtyard on Dolores Street between Ocean Avenue and 7th on their way to check out the menu at Little Napoli or have a glass of wine at Vino Napoli next door. The entrance to the courtyard lies between these two restaurants. In the morning, I am greeted by trucks delivering produce, fish, and spirits. The doors are closed but the bustle has already started inside. I sidestep the delivery men to admire the many Spanish stylistic trademarks. and fountain. Many of these tiles came from Spain. other times in the wine bar. 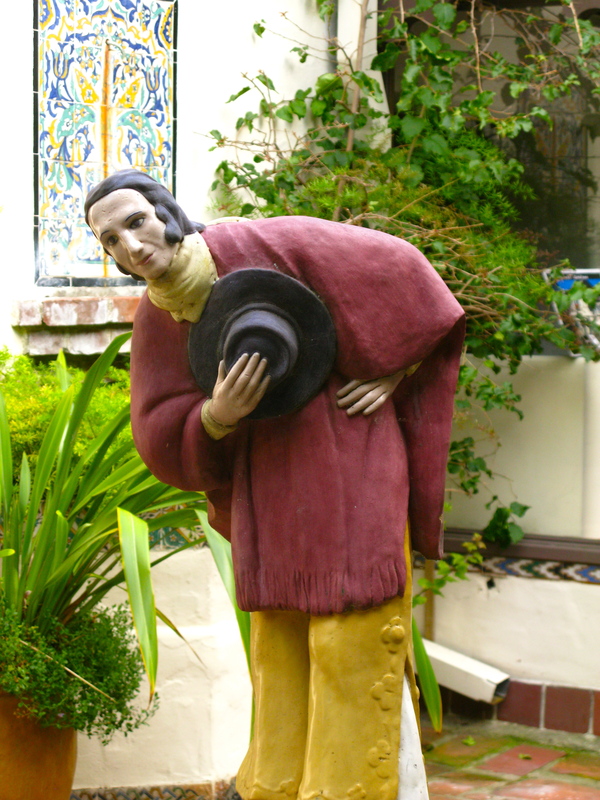 I walk past it to the courtyard’s “centerpiece”- a wonderful sculpture done by Jo Mora in 1928. Mora was a sculptor, painter and writer born in Uruguay who came to the United State as a child. He studied art in New York and Boston and moved to Carmel after WWI. 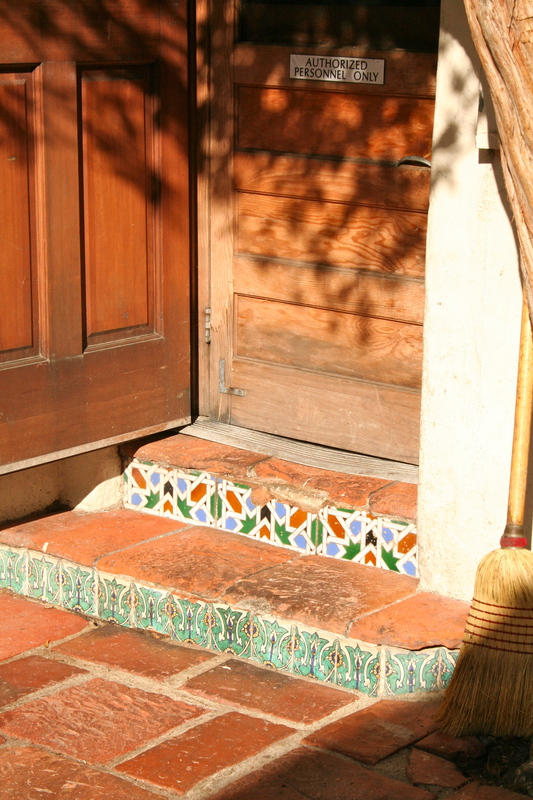 He purchased a full block at San Carlos and First where he built his home and studio. 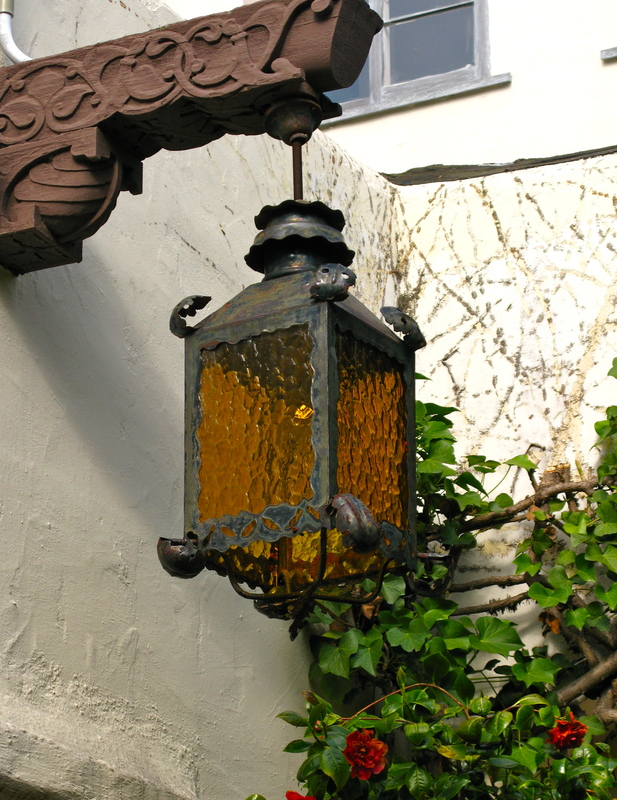 Under this wonderful lantern hung from carved wood, this lovely woman is greeted by this courtly gentleman. 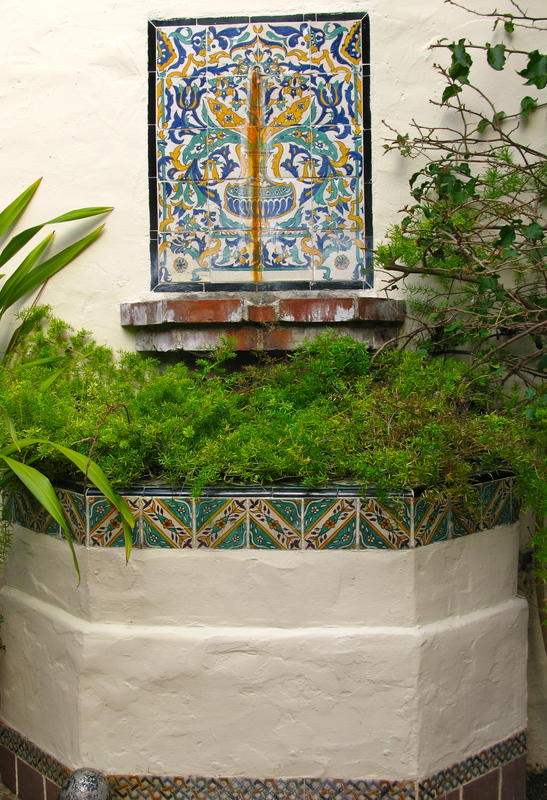 Behind them a fountain with a tiled back splash makes a sweet sound. even though it is just feet away from the kitchen of Little Napoli. The camellias are blooming. 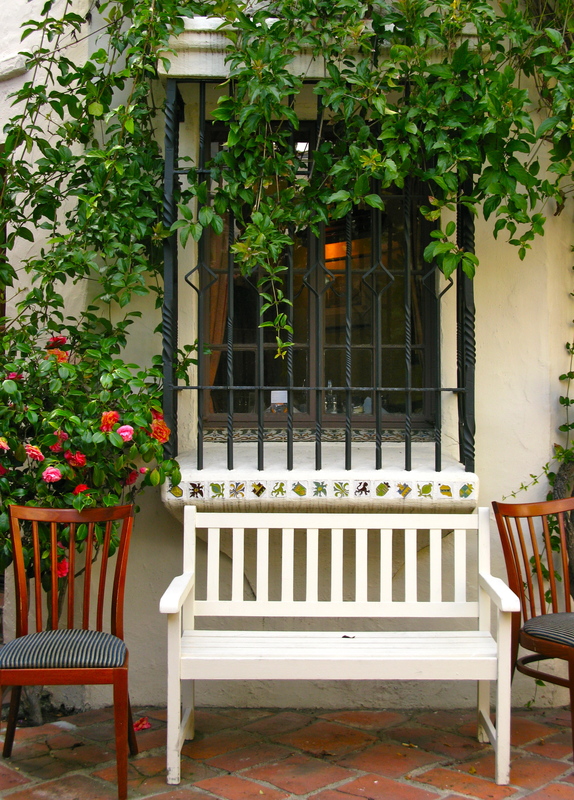 Chairs and a bench await the evening when they will be rearranged for al fresco dining. 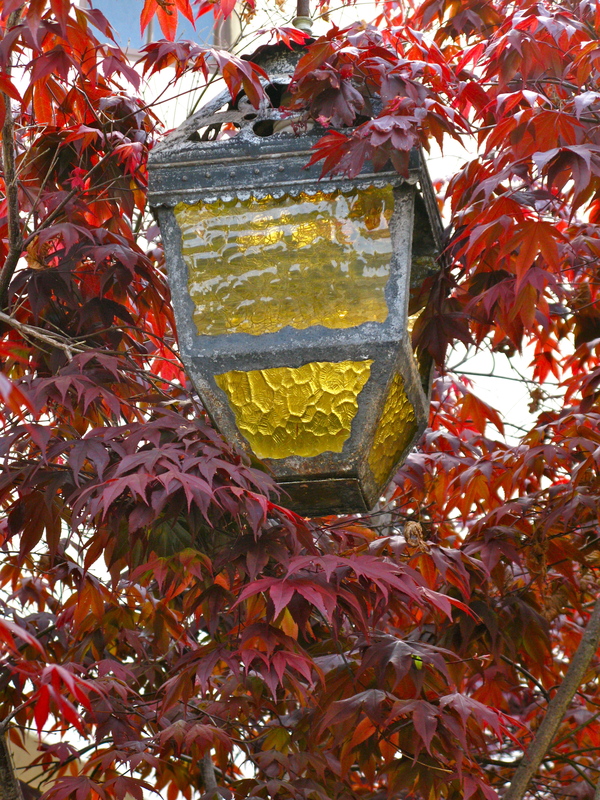 I love the way this light is alway enveloped by the leaves of the Japanese Maple. as is the tiled roof. 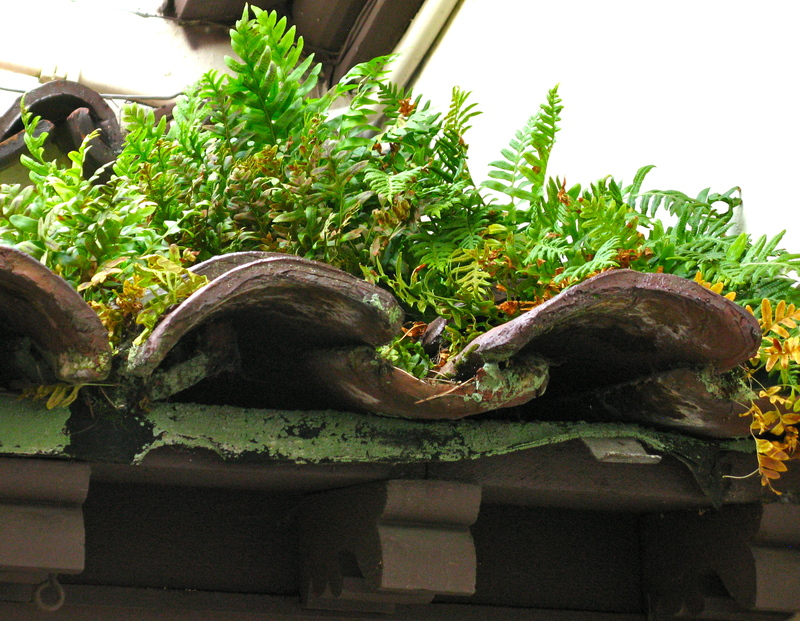 A colony of ferns has decided that this is the perfect place to grow. 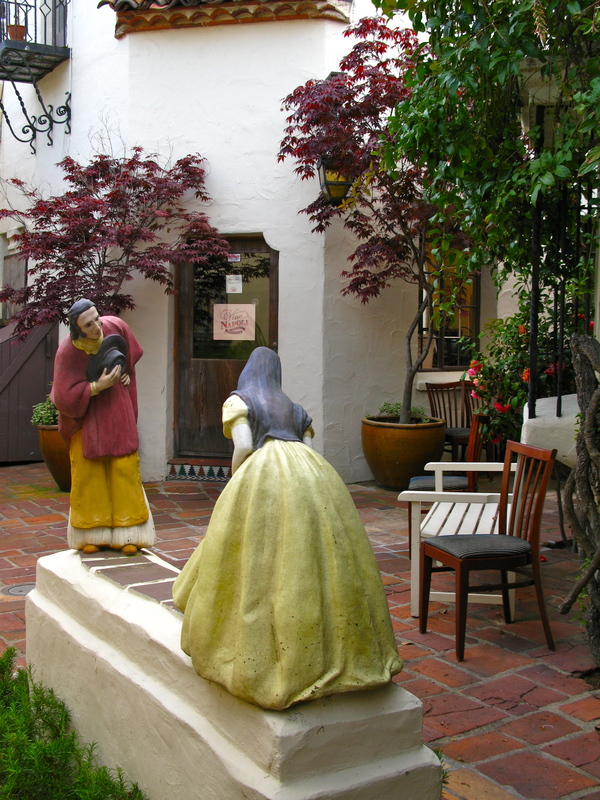 While researching the courtyard , I find a handcrafted book published on this Courtyard. Too expensive for me , but perhaps you are a collector who has interest. 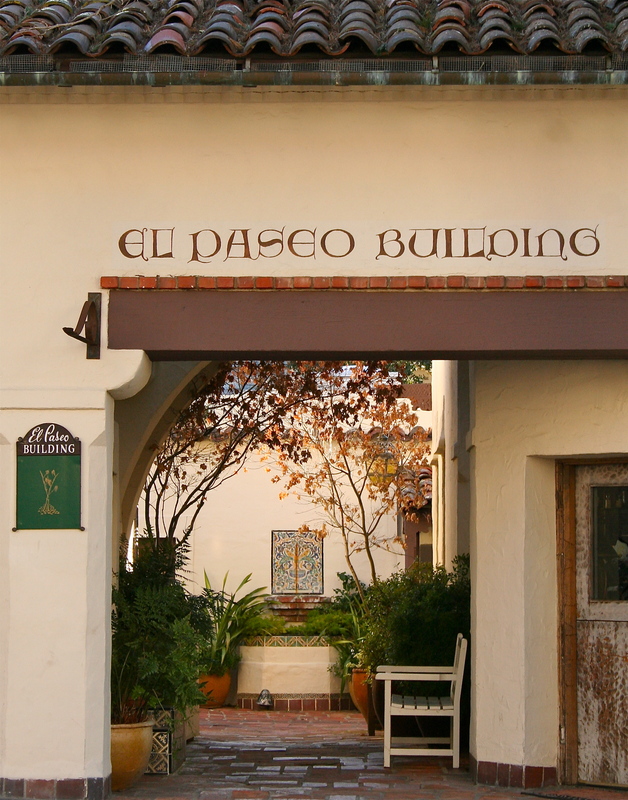 EL PASEO: THE PASSAGE WAY WHERE NEW CALIFORNIA MEETS OLD SPAIN. Seems light years away from this heat and humidity! Nice pictures Rich. a long way from Edgewater Road and Palisade Avenue. 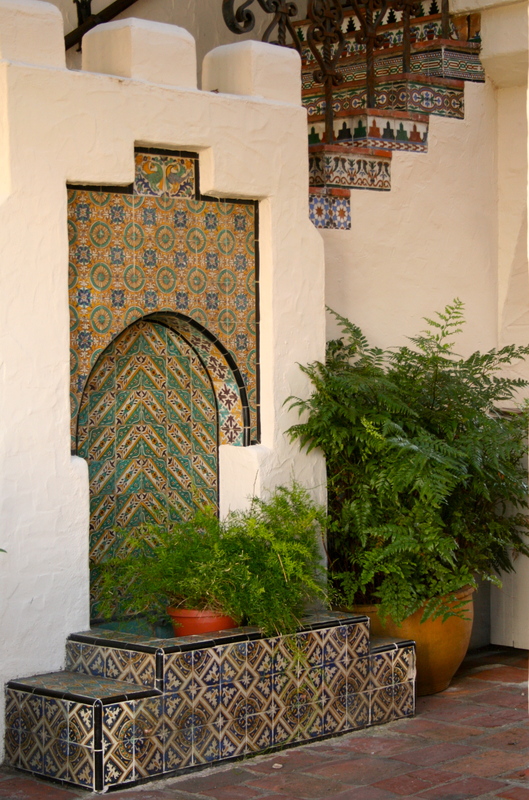 The tile that has 3 little chips out of the face, is Tunisian Tile, made by Jacob Chemla, in the city of Tunis. 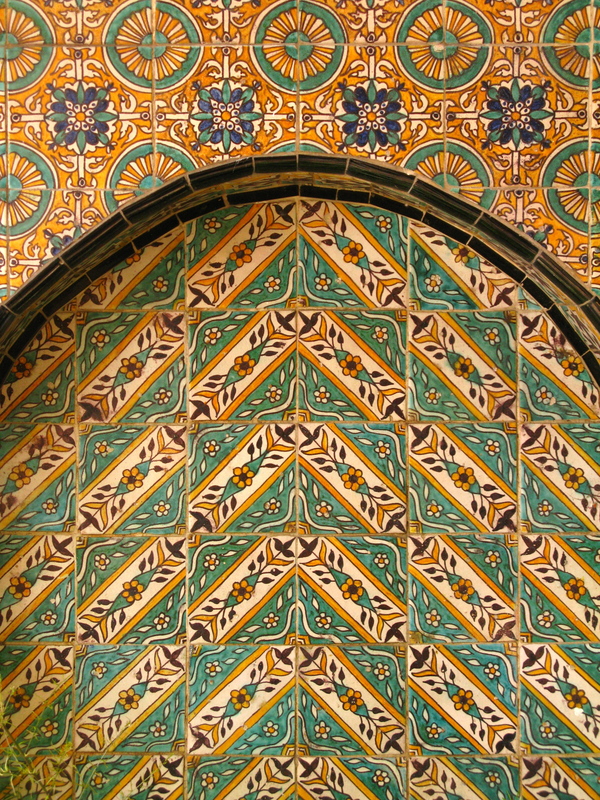 The chips are part of a tile making process that goes back to Ancient Persia. 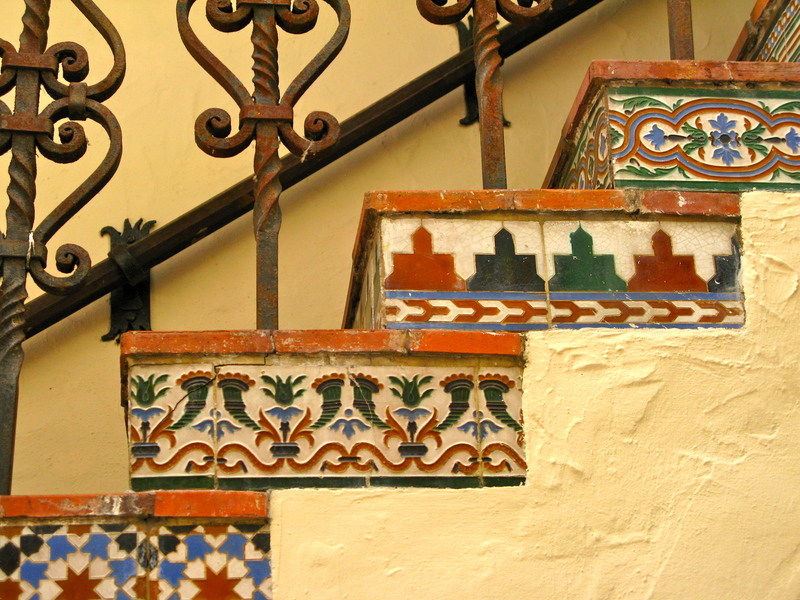 The tile on the staircase are Menasque tile, from Spain. 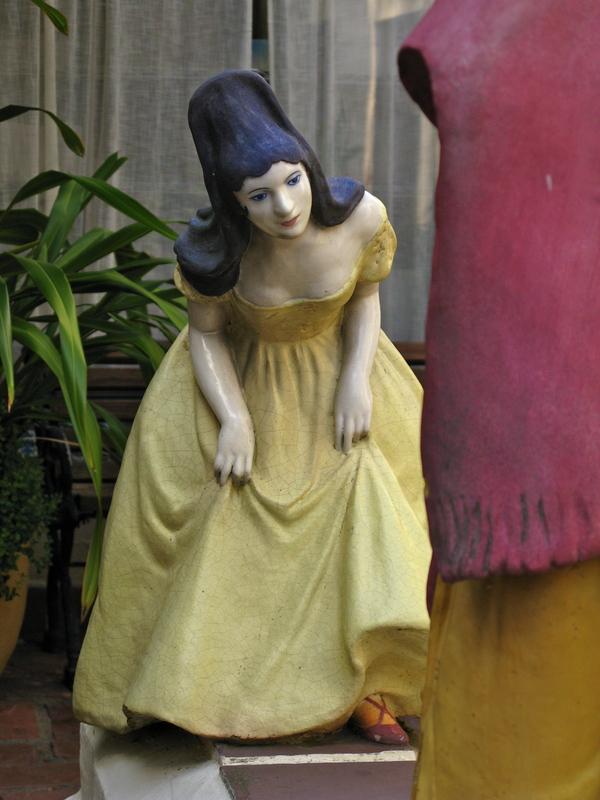 Cuenca technique. 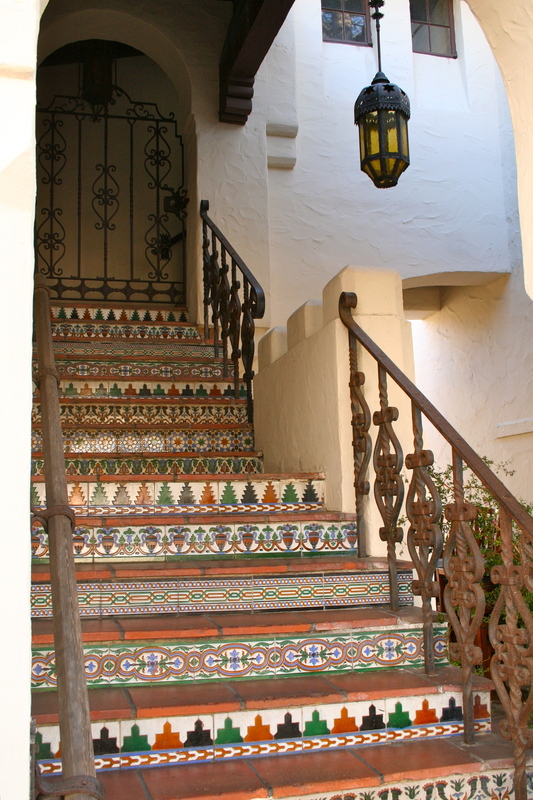 Many of these tiles were also used at the Jackling Mansion in Woodside. George Washington Smith Architect. Demolished by Steve Jobs. I saved all the tile.